A pre-dominantly white fraternity has caused upheaval by throwing a party with offensive racial elements, white students in blackface! Students of the Sigma Phi Epsilon fraternity and Alpha Phi sorority , based on the prestigious University of Los Angeles, hosted a party themed “Kanye Western”. According to the Daily Bruin white students “dressed in baggy clothes, plumped lips and padded bottoms, or as “Kardashians”. Ironically, the majority of the trailer of the highly acclaimed film Dear White People “a satire about being a Black face in a White place”, was shot at the UCLA campus. A film about the experiences of African American students at a predominantly white university which provided social commentary on issues of race and stereotypes. 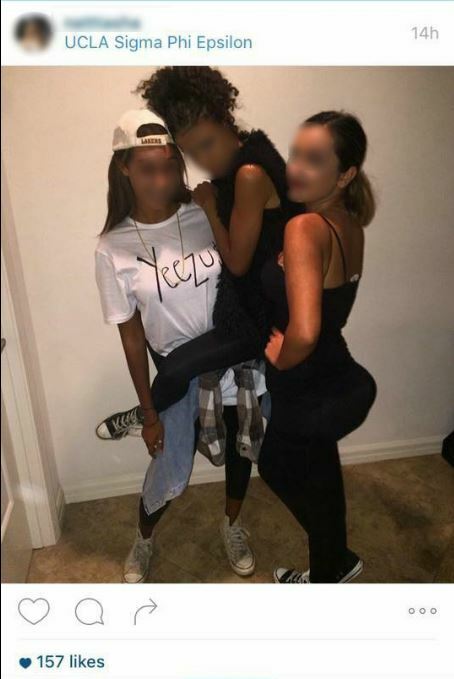 The narrative ended with a group of African-American students crashing a “Black people” themed party which included racial stereotypes from Blackface to watermelon. The Netherlands has its own issues with blackface as well. Whereas blackfacing appears to cause upheaval incidentally on American campuses, blackfacing is the most popular tradition in the Netherlands. From November 14th 2015 to December 5th the Saint Nicolas Season will take place annually students and staff will reproduce the offensive racial caricature Zwarte Piet (Black Pete) on Dutch campuses. Students of color who criticize the tradition risk being excluded and isolated as well. The year I had the privilege to study at the UCLA for a few weeks during a summer program I had a cold winter when a fellow student told me to “Nobody is forcing you to celebrate Sinterklaas. It is a part of Dutch culture so you can accept it and shut up or keep whining and leave” because I criticized the racist tradition Zwarte Piet. Indeed, students of color on Dutch university face similar issues like a lack of diversity, micro-agressions and a Eurocentric curriculum. As Black Bruin students chanted #BlackBruinsMatter, blackfacing needs to stop both on campus and certainly as a national tradition. 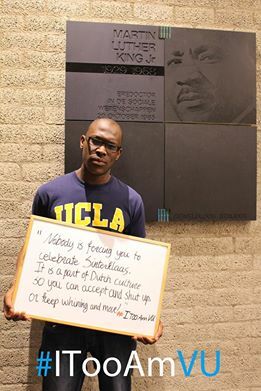 Mitchell Esajas (1988) won the ECHO Award for excellent minority students and studied at the University of Los Angeles in the summer of 2012. He is the co-founder and chair of New Urban Collective, a network of students and young professionals from diverse cultural backgrounds focused on personal development, equality and justice. Together with the University of Color NUC will organize the Decolonizing the University conference with students and scholars from the UK, the US and Portugal on October 24th 2015 at the VU University in Amsterdam.